D1300 - Competition Lion Red (Full Set)size #3The Red Fut San Lion Head are hand-made in China and a..
D1301 - Competition Golden Lion with Pale Yellow Fur (Full Set)The Gold Fut San Lion Head are h..
D1302 - Competition Lion Golden (Full Set)Comes with complete whole set: the head, body, two pants a..
D1303 - Green Lion(Full Set)The Green Fut San Lion Head are hand-made in China and are made in ..
Competition Lion Orange Color (Full Set)Lion Head are hand-made in China and are made in size #3Come..
Competition Northern Lion(Full Set)Please choose the Male Lion or Female LionComes with complete who.. This is a one person lion for small children.Comes with lion head and cloth tail to cover childs bod.. 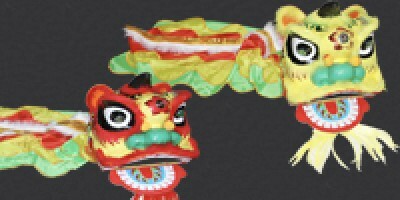 This Small Lion is designed for children, and comes with lion head and cloth tail. Ideal for kids to..
One Person Blue LionThis is an oversized item and does not qualify for free shipping promotions..